One of the new features introduced in Firebug 1.6a14 (will be available later today) is a possibility to use the command line also from other panels (not only from the Console panel). This feature has been requested for a long time and since the command line is one of the most important parts of Firebug, we decided to jump on this and ship the support yet with Firebug 1.6. As usual let's see how this feature looks like from the UI perspective. 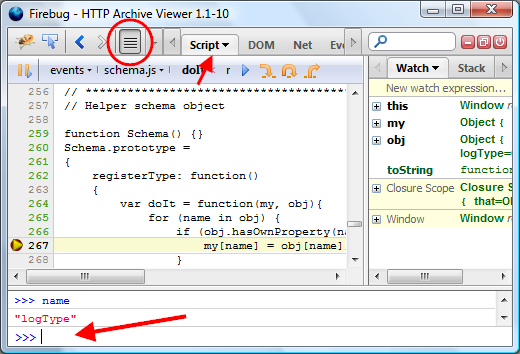 In this particular case, Firebug is opened in a new window (detached), but the same works also for Firebug displayed at the bottom of a browser window (attached). There is a new button in the Firebug toolbar. This one is used to show/hide the command line. The Script panel is now selected. And voilà, here is the Command line! Visibility of the command line can be also controlled by a keyboard shortcut. If it's opened and the user presses the Escape key, it's closed, second snap on the same key opens it again. I believe that this feature opens the door for further improvements, like for example drag and drop of the selected text from e.g. the Script panel into the command line for auto-evaluation. Please if you have any tips how this feature could be yet improved, post a comment here or follow up in the news group, thanks! This is great, much better than the previous version, while i have problem to close the script hint panel. Right now it just saved me a lot time. Thank you.